The thing about Eric Saward, who wrote this script and helped set the tone of Doctor Who overall as script editor during much of the Fifth and all of the Sixth Doctor eras, is that it’s sometimes hard to tell whether he actually liked Doctor Who at all. The worldview he brings to the show is so grim and bleak, so full of pointless violence and brutal ugliness and repugnant imagery, and so insistent on presenting the Doctor and his companions as incompetent and basically useless, that it can feel like he was deliberately trying to torpedo the whole concept of the series from inside. And I think to some extent that’s true: Especially in Britain, early-‘80s sci-fi was full of dark, nilihistic, punk-influenced satire that spit on the utopian idealism of the 1960s and sneered at the future, which a lot of us thought was disquietingly likely to end in nuclear holocaust. Uncomplicated heroism and optimistic outlooks weren’t fashionable, and even though Doctor Who had never been merely that kind of simplistic adventure show, it always changed with the times, and it makes sense that it should have gone in the direction of Terry Gilliam, Repo Man, The Road Warrior and 2000 AD when that was the trend. And so in season 22, we got a Doctor Who replete with black-comedy elements like “Vengeance On Varos,” which skewered capitalism, violence-crazed media and the passive complacency they create in their citizens; the pro-vegetarian “The Two Doctors,” which briefly turned Patrick Troughton’s Second Doctor into a cannibal; and the season-ending “Revelation Of The Daleks,” which takes aim at consumerism, fear of death and the hypocrisies they create in us—the shoddy way we sometimes treat the memory of the deceased, and our tendency to ignore the unpleasant side of how our food and the other things we buy are actually made. (In other words: Meat-is-murder cannibalism again.) And it has a twist ending that, at least as an idea, is truly shocking and puts a knife in the heart of one of Doctor Who’s core concepts. Sounds great, right? Yeah, not so much. 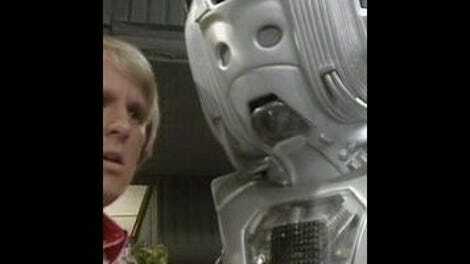 The problem is that Eric Saward is simply not a strong enough writer to pull this off, failing to provide the clever dialogue, well-thought-out underlying concepts or basic plot mechanics that might have made this work, and also apparently actively hostile to the notion that anyone in Doctor Who, or watching it, should be having any fun. (Quite literally: At the end of the story, Peri begs the Doctor to take her “somewhere fun,” and he reacts as if he thinks it’s the stupidest idea he’s ever heard.) Like far too much of the series during this period, “Revelation Of The Daleks” is a grim, depressing slog. It shouldn’t surprise anyone that this was the last serial broadcast before Doctor Who was forced into an 18-month hiatus by BBC executives who had grown hostile to it. The story begins in typical Doctor Who fashion, with the Doctor and his companion arriving on an alien planet in the TARDIS. In this case, it’s the Sixth Doctor, he of the garish multicolored coat and obnoxiously arrogant personality, and the companion is Peri Brown, whose role in the series is sadly limited to complaining and being harrassed by a succession of creepy and sleazy men. (Here, that will be Jobel, the horny funeral director played by Clive Swift, better known as the henpecked husband on the sitcom Keeping Up Appearances.) The planet is Necros, which serves as a future galactic empire’s storehouse of the dead and near-dead—those keeping death at bay by living in suspended animation until medical science can fix them. The Doctor has arrived, so he thinks, for the funeral of a scientist friend named Arthur Stengos. But it’s actually a trap set by his old foe Davros, the insane creator of the Daleks, who wants revenge for “for every indignity you have ever caused me.” Davros has been secretly turning the bodies of Necros to his own uses: Those whose brains are suitable are being turned into a new race of Daleks built out of human DNA, and everyone else is being converted Soylent Green-style into food that Davros is selling back to the famine-plagued galaxy that sent him the dead people in the first place. As the Doctor and Peri are attacked by a zombie on their way into the Tranquil Repose funeral complex, several other subplots spin out: First, Davros is being betrayed by his weaselly and unctuous business partner Kara, played by comedienne Eleanor Bron, who’d appeared earlier on Doctor Who in a cameo with John Cleese in “City Of Death.” To kill Davros, she’s hired the noble assassin Orcini and his revolting henchman Bostock (who “may smell like rotting flesh, but he's an excellent squire,” says Orcini). Second, there’s two more people in search of Arthur Stengos: His daughter Natasha and an alcoholic doctor named Grigory, who correctly suspect there’s something fishy going on. 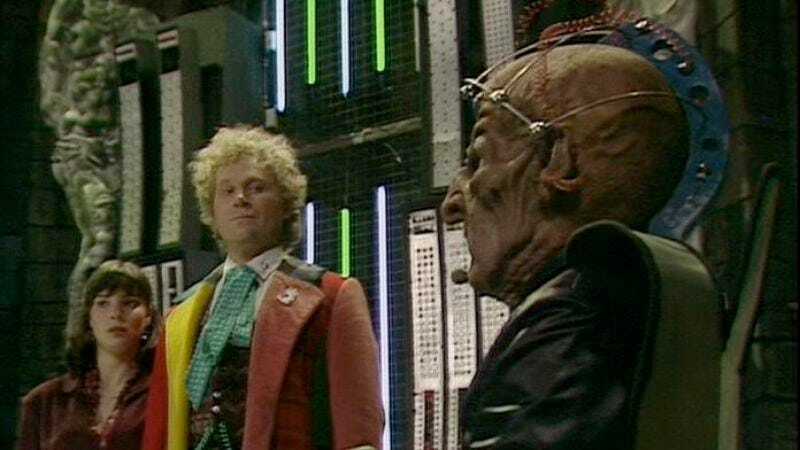 Third, the staff of the funerary complex prepare to receive the body of the galactic president’s wife, led by the aforementioned sleazo Jobel and his dumpy second-in-command Tasambeker, who nurses a secret crush on her boss that Davros will exploit. And lastly, Alexei Sayle (best known for The Young Ones) plays a hyperactive DJ who broadcasts old-time rock music to the sleepers in suspended animation while privately sneering at what passes for their lives. That’s a lot of subplots to juggle, and Saward handles them just as well as he did in his last script, “Resurrection Of The Daleks”—which is to say, badly. With limited exceptions, the plotlines don’t converge in any meaningful way or build collectively toward a conclusion, and Saward once again throws in a few genuinely compelling ideas without actually doing anything with them, leading me to wonder if he even knew what he had come up with. The storyline about the president’s wife arriving fizzles out since she never actually arrives. Which is a golden chance for political satire thrown away, since in 1985 the phrase “the president’s wife” meant Nancy Reagan. How would she have reacted to Davros’ offer to become one of the new masters of the universe? Would she be horrified, or tempted, or both at once? Meanwhile, Tasambeker is suborned by Davros into killing Jobel, which is pointless since a Dalek exterminates her not long after that. Both subplots are snuffed out before they reach their logical endpoint—they would have been powerful ways to showcase the horrific transformation of humans into Daleks. Because that’s the only good reason I can think of for Davros to have wheedled Tasambeker into becoming a murderer—he could kill Jobel himself anytime he wants to, but he’s noticed her pettiness, officiousness, and anger, and thinks she’s already halfway to being a Dalek in attitude. If she kills Jobel, she’s worthy of joining his new army—and she might even have liked it. Especially if Tasambeker had decided to volunteer for conversion, that would have put a real sting in the dark comedy here by showing how the wrong life choices can literally be alienating. Davros also mentions offhandedly that he hopes to turn the Doctor into one of his Daleks, but just like his scheme to clone the Doctor in “Resurrection Of The Daleks,” the idea is quietly dropped without further elaboration. And other than observing events unfold around him, the Doctor plays almost no part in the story, spending more than half the running time simply trying to get to Tranquil Repose, and not even meeting Davros until 10 minutes before the end. This is another one of those weird quirks of Eric Saward’s Doctor Who, like his distasteful enthusiasm for glorifying killers and criminals like Orcini here and Lytton in “Resurrection Of The Daleks.” Saward seems to hate the idea that the Doctor is the star of the series, and consistently does whatever he can to prevent him from being an effective part of his own story—he gets delayed, he wanders around far from the real action, he stands by and watches once he’s allowed to arrive, and often the story ends with a deus ex machina that barely involves him at all. It happens in “Vengeance On Varos,” “The Twin Dilemma,” “Resurrection Of The Daleks,” in this story, and over and over throughout Saward’s time on the show. I really don’t get what this was meant to accomplish. Here, though, the deus ex machina at least has a certain acidic resonance, since it’s the Daleks who save the day—the original gray models, sweeping in to eliminate or absorb Davros’ counterfeit creations. That’s either the most incompetent or the most bitterly cynical deus ex machina in the history of the series. And I’m not entirely sure what to make of it, but the notion that there are true and false Daleks is part of a repeated motif of falseness throughout the story. Natasha’s father’s body is fake, the white-and-gold Daleks are fake, Alexei Sayle’s obnoxious American persona is a fake, Davros’ severed head is a fake, Orcini’s leg is a fake, Kara and Vogel are fakes. Davros thinks he’s the true leader of the Daleks, but the grays refuse to acknowledge his authority—and why should they? He might be their creator, but of course Doctor Who created him long after it introduced them. And after Davros came on the scene in “Genesis Of The Daleks,” his story wound up overshadowing theirs for the rest of classic-era Doctor Who. I can see how they might resent that. What does work well here? Well, even if I think Arthur Stengos was not the ideal choice to be the person we see converted into a Dalek, the revelation of what has happened to him is a truly creepy, powerful scene: His daughter watches in horror as his mutilated head, encased by the spectacular imagery of the glass Dalek shell, visibly loses what’s left of his humanity to Davros’ mental conditioning as he’s wracked by spasms of vicious Dalek rage. I wish the rest of this had lived up to that scene. Terry Molloy's Davros here is also the best version since Michael Wisher originated the role. He plays it way over-the-top, but that’s who the character is, and he brings in gradations of tone that effectively captures the several moods that define Davros—his gloating arrogance, his sudden bursts of psychotic ranting, his sneakiness and ability to get people to do what he wants by playing on their deepest weaknesses. And, though I’m a little surprised to admit this, I liked some of Alexei Sayle’s segment. True, he’s often annoying, and his sub-Andy Kaufman shtick is even more irritatingly tangential than on The Young Ones since his antic burblings are so at odds with the grim tone of the rest of the show. But the idea of killing Daleks with a focused beam of pure rock ‘n’ roll is a pretty great idea. And once the DJ stops his painfully unfunny riffing and Elvis impersonations and starts talking to Peri, we get something that’s vanishingly rare for this era: Two people befriending each other and bonding over an unselfconscious love of something as pure and simple and fun as rock music and kitschy Americana. It’s the only moment of pure, uncynically happy human feeling in “Revelation Of The Daleks,” and maybe the entire season. And they wanted to avoid that kind of thing—why, exactly? • How deeply, insanely committed is Davros to his fake-head-in-a-jar ploy to foil potential assassins? Not that it’s a bad idea for Davros to have set up a decoy—that’s Crafty Evil Mastermind 101, and shows his wise (for a villain) deviousness and paranoia. But since the audience has been watching the head-in-a-jar Davros for most of the story, that means that the real Davros is skulking in the shadows and using his puppet to interact with the outside world even when nobody else is around to see it. • Supposedly, producer John Nathan-Turner offered the role of the half-crazed zombie that attacks the Doctor in the woods to none other than Sir Laurence Olivier. Which seems insane, but then again, Orson Welles played an evil sentient planet in Transformers: The Motion Picture. • Clive Swift later returned to Doctor Who in the Tenth Doctor Christmas special “Voyage Of The Damned” as the kindly starliner passenger Copper. • The last line of the story cuts off in the middle of a sentence, on purpose. Originally, the Doctor was supposed to relent to Peri’s insistence that they go on an actual vacation for once, and to say “All right, I'll take you to Blackpool”—the British seaside town known for its amusement park. But since Doctor Who was about to be put on hiatus, it was decided that naming a specific place might complicate things when the show would be restarted in 18 months, so the last word was chopped off in editing.